The Trade War between the United States, China and other top economy nations can be studied from various angles and over shorter and longer periods of time to better understand it. And since the U.S. and China are by far the world’s two largest economies, any trade disputes between them have the largest ramifications. We will cover this topic both in the short term (2018-2020) and the longer term (1961-2080). As we shall see also, trade wars and disputes share many of the same issues with immigration. Currently President Trump is threatening to shut down the southern border with Mexico, pull back trade with Mexico and cut aid to three Central American countries (Honduras, Guatemala, and El Salvador) if Democrats do not agree to sufficient funding for the southern border wall. My astrological perspective on the short term view (2018-2020) is that the Trade War between the U.S., China and other nations should be resolved by late Jan. 2020, though some issues such as with intellectual property rights could drag on up to late 2020 – with the U.S. Presidential Election Nov. 3, 2020 and the Jupiter-Saturn conjunction in Capricorn Dec. 21, 2020. If the Trade Wars are largely settled months prior to the election, then the Globalist vs. Nationalist fight moves on to the 2020 election with further focus on immigration issues and how much power the nation-state retains against the advancing encroachment of Globalism and its advocacy of Open Borders. 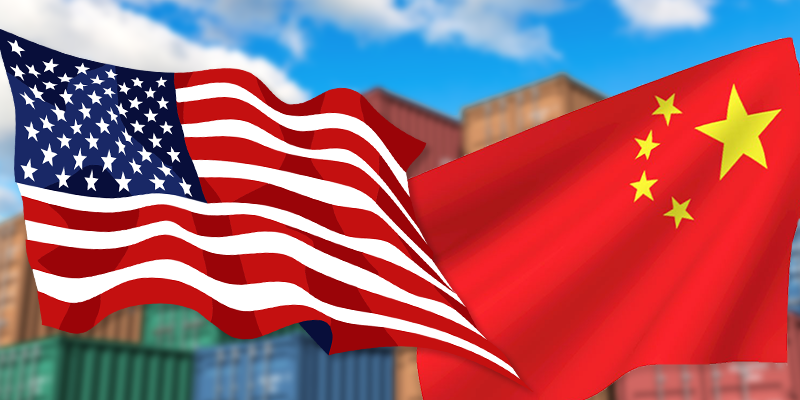 The end of the current 90-day “Trade War Truce” with China (March 1, 2019) is too short a time to complete negotiations of problematic issues that have existed for decades. But by early 2020 the U.S. should resolve its most serious trade disputes with China in a very positive way for the U.S., even if some issues persist. Some important timing factors include the Saturn-Pluto conjunction Jan. 12, 2020 in late Sagittarius, as well as tr. Saturn’s exit from Sagittarius Jan. 24, 2020. Pluto’s final exit from Sagittarius occurs Dec. 30, 2020 (all sidereal zodiac), but Saturn’s exit 11 months earlier is likely to be more decisive, including the month leading up to it. From Dec. 26, 2019 to Jan. 14, 2020 tr. Sun, Mercury, Jupiter, Saturn, Pluto and Ketu will all be in Sagittarius, with eclipses Dec. 26, 2019 and Jan. 10, 2020 in Sagittarius and Gemini. This is a huge amount of planetary emphasis in just one zodiacal area. In addition, all classical physical planets will be stacked up in either Scorpio (Mars), Sagittarius, or Capricorn (Venus). The Solar eclipse Dec. 26, 2019 is at 9°59’ Sagittarius, within 1° orb of the USA Ascendant at 8°59’ Sagittarius. (Kelleher chart) Tr. Jupiter is then at 11°12’ Sagittarius, giving some protection and blessing to what should be dramatic results for the U.S. and its trading partners. Another major trading bloc involves the United States, Canada and Mexico. The U.S. is the world’s no. 1 largest economy, while Canada is no. 10 and Mexico is no. 15 (Aug. 2018 statistics). After several months of trade disputes and negotiations starting in spring 2018 with new tariffs imposed by the U.S., Pres. Trump signed a new trilateral agreement: the United States-Mexico-Canada Agreement, or USMCA. This occurred on Nov. 30, 2018 at the end of the G20 Summit in Argentina. The USMCA was drafted Sept. 30, 2018, close to a Saturn Stationary Direct Sept. 6, 2018 and Pluto Stationary Direct on Oct. 1, 2018, both in Sagittarius, thus good omens for the success of the treaty, especially since Saturn turned SD at 8°26’ Sagittarius – within 33’ orb of the USA Ascendant at 8°59’ Sagittarius. (The previous treaty, the North American Free Trade Agreement (NAFTA) was signed Dec. 8, 1993 and went into effect Jan. 1, 1994.) The USMCA replaces NAFTA with a more fair and balanced trade deal for the U.S. and includes far better protections for workers in all three countries. The tariffs that Trump imposed on Canada and Mexico earlier in 2018 remain in effect with the new agreement, which should become law in the latter half of 2019 or by Jan. 1, 2020. Canada and Mexico have no real obstacles to the ratification process, but U.S. Democrats will oppose any agreement signed by Trump. So this may well take longer for the U.S. Congress to ratify. My longer term view (1961-2080) is that the U.S. will continue to dominate over China politically and economically. We look at national charts, longer term Jupiter-Saturn conjunction cycles, and the JU-SA conjunction chart for Feb. 18, 1961 set for the national capitals of the U.S. and China. 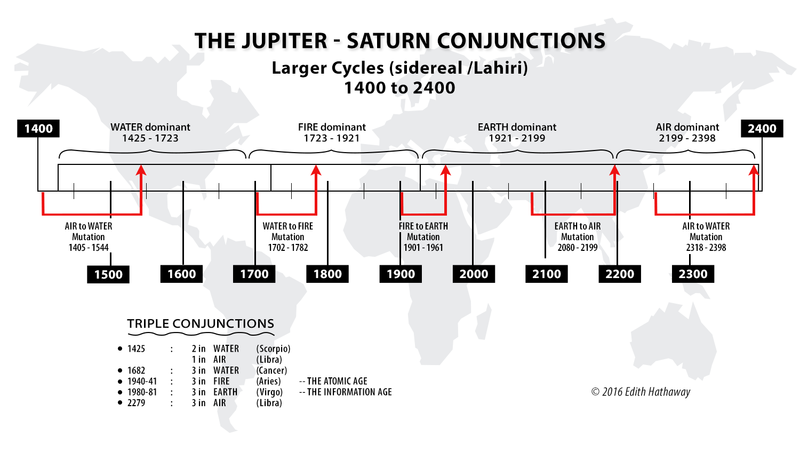 JU-SA conjunctions occur every 20 years, and when they predominate in one element, the impact of Jupiter and Saturn in that element is crucial, as is the JU-SA conjunction of Feb. 1961 for assessing the current EARTH period. We discuss why that conjunction was so pivotal. We also look at some supporting non-astrological materials, with statistics on the Top 5 economies in the world, the U.S. at no. 1 and China no. 2. Japan held the no. 2 spot for 42 years up to Aug. 2010, when it became no. 3 behind China. Germany holds the no. 4 spot, and India and the U.K. have recently traded places back and forth for the no. 5 spot. India is projected to replace the UK again in 2019, and is currently the fastest growing trillion dollar economy in the world. Learning some basics about these 5 top economies gives us a better perspective on the Trade Wars and the general situation between top trading partners in the world. In the shorter term, the time is absolutely right from Jan. 2018 to late Jan. 2020 for major trade disputes to arise and be negotiated. When tr. Pluto traverses in and out of the last pada (3°20’) of sidereal Sagittarius (March 8, 2018 to Dec. 30, 2020), it has a very dramatic effect on all the many areas associated with Sagittarius as well as the Gemini-Sagittarius axis – what I call “the nervous system of the world.” This is the major axis for international trade, communications, media, law, publishing, and education. Legal matters pertaining to freedom of speech, due process, censorship, surveillance and information exchange are all Sagittarian issues, as are religion and the military; also international travel and immigration matters. Tr. Pluto’s last 6 months in Sagittarius, June 30 to Dec. 30, 2020, may be the time when many loose ends to various legal reforms arise and are resolved, including on trade and immigration. The Gemini end of the Sagittarian axis is more concerned with the commercial aspect of all the above. And being in the EARTH period, when the 20-year Jupiter-Saturn conjunction cycles predominate in sidereal EARTH, much of the world is focused on how information can become not only more practical, but a commodity more effective and profitable for business – whether legally or illegally. Citizens do benefit from the technologies, but with the influence of the 1940-1941 triple FIRE conjunctions in Aries, the military funded much of the major information technology advances and still controls it. With the influence of the triple JU-SA conjunctions in Virgo (ruled by Mercury) in 1980-1981, the Information Age brought corporate and military forces together to weaponize information for gain and profit at the expense of citizens, much of this through data collection and surveillance. The process has accelerated since the JU-SA conjunction in Capricorn in Feb. 1961, with its effects running strongly up through March 2080. Eisenhower intended to use the phrase “military-industrial-congressional complex,” but was advised against it. However, he was prescient and knew better that legislators were equally involved in doing the bidding of their corporate funders, more so than working for the citizens who voted for them and whom they were supposed to represent. Currently corporate lobbyists vastly outnumber legislators in the U.S. Congress. Additionally, this all occurs in the midst of unprecedented technological advances, giving speed and breadth to communications and a breathtaking capacity throughout the world for data collection and surveillance (ripe for censorship, blackmail, identity and intellectual property theft, etc.). On a more positive note, in the last two years cyber sleuths have captured some of the most elusive criminals, including major drug and human traffickers who thrive on porous national borders. Additionally, Pluto’s presence in this last sector of Sagittarius brings more radical measures and rampant abuses to light so they can be dealt with more effectively. Pluto also gets support from several other planets in Sagittarius, as we will discuss shortly. Finding solutions to issues in this arena becomes more urgent during the 2018-2020 time frame, and postponement of solutions is no longer tenable. With trade and immigration, some of the abuses involve crime and large amounts of money, as with the drug and human traffickers. Both trade and immigration concern national boundaries in various ways, including geographical and in cyberspace. By contrast the United States was among 10 or more nations that did not sign the U.N. agreement, stating that this was “an effort by the United Nations to advance global governance at the expense of the sovereign right of states.” Not wishing to support unlimited mass migration, the Trump administration argues that it currently spends over $200 billion per year on illegal immigrants. ($18 billion of that is on health care for illegal immigrants.) The U.S. loses even more due to theft from cyberspace. Meanwhile, many citizen journalists and those in the independent media investigating and reporting on the advances of Globalism have been routinely censored, de-platformed (i.e. removed from Twitter, Facebook, YouTube, et. al.) and de-monetized for no apparent reason, at least none that also applies to those on the Left. Freedom of speech in the U.S. has indeed become endangered for those lacking the “politically correct” view, though protected for those who have it. We move on next to a more detailed look at how the current Trade Wars are impacted by current planetary configurations. From Jan. 2018 onward the United States under the Trump administration pushed for major reforms in how business is conducted between the U.S. and its most important trading partners, notably China. As mentioned previously, the U.S. and China are the two largest economies in the world, the U.S. being no. 1 and China no. 2. The major concern with China is over not only unfair trade practices and tariffs, but over cyber security and theft of intellectual property rights, all of these harming U.S. business interests in a big way. In Aug. 2017 investigations began into Chinese theft of U.S. intellectual property rights, then estimated to cost between $225 and $600 billion per year. Over the next 2 years tr. Saturn and Pluto in sidereal Sagittarius will be joined by tr. Ketu (with Rahu in Gemini), followed by Jupiter. Since Oct. 26, 2017 (through Jan. 24, 2020) tr. Saturn brings the light of truth and commitment to whatever it touches, this time in the Sagittarian realm, often causing some initial contraction and crisis in the process of deeper scrutiny. Rahu and Ketu (the Lunar Nodes) travel on the Gemini-Sagittarius axis from March 6, 2019 to Sept. 23, 2020, so most eclipses over this 18 month period will occur on the Gemini-Sagittarius axis, with a precursor in Sagittarius Jan. 6, 2019. This brings some added turbulence and unpredictability to these areas of life as people deal with new trading and legal reforms internationally as well as the forces pushing against such reforms. There are 5 eclipses in 2019, 4 of them on the Gemini-Sagittarius axis (see list further below); and 6 eclipses in 2020 (higher than average), with 3 eclipses on the Gemini-Sagittarius axis. Tr. Jupiter joins this planetary grouping on and off from March 30, 2019 through Nov. 21, 2020, lending support and expansion leading up to the 20-year JU-SA conjunction Dec. 21, 2020 at 6°20’ Capricorn. With such concentration of planetary energy in Sagittarius over the next 2 years, and tr. Pluto in late Sagittarius from now up to Dec. 30, 2020, the time is right for major changes to occur in Sagittarian arenas, as well as the all-important Gemini-Sagittarius axis. Large trade imbalances and inequitable practices have continued for many years without being addressed, and many of these factors work against the United States. This is why President Trump made this a presidential campaign promise in 2015-2016 and is now finally demanding big changes to protect U.S. interests and correct the enormous trade deficit with China and other nations, though mostly with China. This same Sagittarian focus pushes Trump’s immigration policies, and the urgency to act on them, given the increasing crises in both arenas. Tr. Saturn’s presence in sidereal Sagittarius confirms this reality, as it falls on the Ascendant of the USA chart (Kelleher: July 4, 1776, 6:30 pm LMT, Philadelphia, PA, Ascendant: 8°59’ Sagittarius.) A three month truce of the U.S.-China Trade War was announced in Buenos Aries, Argentina Dec. 1, 2018, but as we have already noted, the end of the 3-month period on March 1, 2019 is unlikely to be as decisive a turning point as Jan. 12, 2020, with the Saturn-Pluto conjunction at 28°38’ Sagittarius, or when tr. Saturn exits Sagittarius Jan. 24, 2020. The SA-PL conjunction occurs in the Vargottama sector of Sagittarius. (Vargottama occurs in Sagittarius and all dual signs in the last pada (3°20’) of the sign. It repeats in this same segment of the zodiac in many sub-charts, thus gaining strength.) Prior to Jan. 12, 2020 the Trade War will be punctuated at various important junctures shown by planetary stations and eclipses (see lists below), notably the Pluto stations April 24 and Oct. 3, 2019 in the Vargottama sector of Sagittarius, with Saturn and Pluto both closely combust the Sun on Jan. 12, 2020. Pluto transits through Sagittarius for 15 ½ years from Feb. 8, 2005 to Dec. 30, 2020, with some brief hiatuses into the adjacent signs. Tr. Pluto entered the last pada (3°20’) of Sagittarius 3 ½ months after tr. Saturn entered Sagittarius in late Oct. 2017. Coincidentally, in late Jan. 2018 President Trump took his first actions in the Trade War with China and other nations, imposing a 30% tariff on foreign solar panels, to be reduced to 15% after 4 years. This applied mainly to China, the largest producer of solar panels worldwide. A 20% tariff was also applied to the first 1.2 million washing machines exported from China. In 2016 China had exported $425 million worth of washing machines to the U.S.
China retaliated by imposing tariffs on 128 American products they import from the United States. This occurred on April 2, 2018, within weeks of the Pluto SR on April 22, 2018. We can expect additional intensity in the weeks surrounding the planetary stations and eclipses. Pres. Trump initiated the Trade Wars with a series of tariffs – which though heavily criticized by his political enemies – have contributed to how his economic policies have increased U.S. economic growth dramatically in just two years. The U.S. Gross Domestic Product (GDP) is now at 2.9% from its low of 1.5% throughout 2016, the last year of Obama’s presidency. Unemployment is also at historic lows at 3.7%, including for women and minorities. Obama’s economic advisor Larry Summers had said that such figures would be “a fairy tale” to achieve. Here is a list of major events and dates for outer planets Jupiter, Saturn and Pluto and eclipses in Sagittarius (or Gemini) from late 2017 through late 2020, given in planetary groupings rather than in strict chronological sequence. • Tr. Pluto in Sagittarius: Feb. 8, 2005 to Dec. 30, 2020 (15 ½ yrs.). • Tr. Saturn in Sagittarius: Oct. 26, 2017 to Jan. 24, 2020. Other longer range techniques can be used to assess the competition between the 5 top trading partners in the world, examining both their national charts and the charts of the Feb. 18, 1961 Jupiter-Saturn conjunction set for the national capital of a country. The 1961 JU-SA conjunction is pivotal in setting the stage for the rest of the 278-year EARTH period (1921 to 2199), when the JU-SA conjunctions occur primarily in sidereal EARTH signs. The 1961 JU-SA conjunction chart applies to the whole EARTH period, but especially to the years 1961-2080. This puts the focus on the central part of the EARTH period and not the Mutation periods, when there is a gradual shifting from one predominant element to another. (The FIRE TO EARTH Mutation period runs from 1901 to 1961. The EARTH TO AIR Mutation period runs from 2080 to 2199.) During the EARTH period, notably from 1961 to 2080 but not exclusively, the sovereignty of the nation-state is more vulnerable. We see this battle play out right now between the Globalists and the Nationalists. Though Nationalism got a bad name in the aftermath of World Wars I and II, the situation now is not akin to that period. New forces are at play, not least of which are technological and the power of corporate conglomerates and Globalists. I first introduced this topic in my Oct. 2010 lecture at the World Conference on Mundane Astrology held in Vishakapatnam, India: Corporate Conglomerates vs. Nation States: Which Nations will Survive and Thrive? My 2010 conclusions regarding which nations remain dominant are the same today, over 8 years later. Despite widely held predictions at that time that China would overtake the U.S. in economic and political dominance, I found that the national and 1961 charts indicated otherwise and that the U.S. would retain its current dominance. Here are some important statistics confirming my 2010 analysis, after which we will look at the supporting astrological materials that originated from my 2010 lecture and article. CHINA: Pop. 1.4 billion : Pop. growth 2008 to 2016: 24% : Household consumption: $3,000 per person per yr. (despite some very rich elites): Exports: 43 times higher in 2016 than in 1988 (overly reliant on exports; mega-factories built for exports.) $20 trillion invested between 2007 and 2016, which is way over-sized for a poor population with minimal internal market. INDIA: Pop. 1.3 billion : Pop. growth 2008 to 2016: 59% : Household consumption: $1000 per person per yr. : Very under-developed economy. In 2017 and 2018 the United Kingdom replaced India for the No. 5 spot, but by 2019 India is projected to regain the No. 5 spot. Japan, meanwhile, held the No. 2 spot for 42 years, but was overtaken in Aug. 2010 by China, which remains No. 2. Japan’s relatively small, aging and slow-growth population is far outmatched by China, even if Japan has a 99% literacy rate and the best longevity rate. But as of Dec. 2018, Japan’s birth rate is at a 120-year historic low of 1.73%, below the 2.08% needed to keep the population stable. Of these 5 top economies, China has the largest population, though the U.S. has a higher population growth rate. Like Germany, China’s reliance on exports makes both countries eager to embrace Globalism, since their internal markets are far weaker than the U.S. internal market. Despite being only a distant third to China and India in total population, the U.S. has an overwhelming advantage as a trading partner. Not only does it have a strong internal market, but it is not dependent on exports. This gives President Trump a strong upper hand in any trade negotiations, as no national unified market in the world is as large as the one in the U.S. But if there were a Globalist government (as advocated by the United Nations and many on the Left), the U.S. population would have minimal impact next to the combined populations of China and India, at 2.7 billion as of 2016. Household consumption is the market value of all the goods and services spent by households. Property purchases are excluded. U.S. household consumption in 2016 is $40,000 per person per yr., compared to China’s $3,000 per person per yr. (up from $1000 per person per year in 1988), and India’s $1000 per person per yr. in 2016. And though India’s population growth is explosive, at 59% over 28 years, it is still a relatively poor country lacking the infrastructure and resources to support this rate of growth. It is also still considered a tiny market. Meanwhile, China’s internal market, as shown by its average household consumption ($3000 per yr.) does not support the money invested in the country (ca. $5 trillion in 2016). Despite some very wealthy elites among the Chinese, typically in Hong Kong or Shanghai, the majority are very poor. And there appears to be a massively ill-conceived level of investment for the economic capacity of the majority of the population. This has led, for instance, to the building of large residential structures and shopping malls that remain unoccupied because so many citizens are unable to afford them. Everything has been geared to exports in China, such that by 2008 China’s exports were 90% of the local consumption. In economic terms, the U.S. currently has a big lead over China, but China is aggressively increasing its military power and wants to attain world dominance. So the U.S. needs to stay militarily strong to meet this threat, among others. The U.S. also needs to reduce its debt and strengthen the private sector. The national chart: Once you have researched the most trustworthy chart from key documents, you examine it from the point of view of mundane astrology, not natal astrology, though it is the birth chart of a nation and can be read for the personality of a nation, its strengths and weaknesses in many arenas, as well as its timing. Like any birth chart, the national chart reveals the destiny of a nation. Longer trends can be reviewed through planetary transits, the system of Dashas (planetary periods) and the JU-SA conjunction charts. There are bound to be discrepancies regarding the date and time a nation is founded, but I recommend Nick Campion’s Book of World Horoscopes as a source for most charts, including the China national chart (1949). For the U.S. chart, for many years I have used James Kelleher’s rectified chart and with good results. It is set for July 4, 1776, 18:30 LMT, Philadelphia, PA. The Feb. 1961 JU-SA conjunction chart set for a nation’s capital: The Jupiter-Saturn conjunction occurs every 20 years and is known to mark socio-political-economic cycles. We check the strength of this chart against the national chart. If the JU-SA conjunction chart is strong but the national chart is weak, we cannot confirm that the 120-year forecast will hold up through 2080. If both charts are strong, then there is a positive forecast for the nation. Though any JU-SA conjunction chart can be read, in my opinion the 1961 JU-SA conjunction chart carries the most weight for assessing the EARTH period. The Navamsha (9th harmonic) chart becomes pivotal, since all charts are set for the same date and there are similarities that occur, especially close to the same degree of geographical longitude. Also, it appears that more than one national capital tends to promote turbulence in that country, e.g. Israel and South Africa. The JU-SA conjunction recurs in Capricorn in the EARTH period three more times: Dec. 21, 2020, March 14, 2080, and Jan. 14, 2140. The Feb. 1961 JU-SA conjunction has tremendous power as it marks the official start of the EARTH period after the Mutation period from FIRE TO EARTH ended after 60 years. March 2080 marks the start of the next Mutation period. So only the conjunctions of 1961 and 2020 fall solidly within the EARTH period and not in a Mutation period. The Dec. 2020 conjunction is at the half-way mark of the 120-year cycle (1921-2080), but Feb. 1961 marks the most pivotal juncture, being the starting point. The 1961 JU-SA conjunction has added power being in the Vargottama sector of a chara (cardinal) sign: Aries, Cancer, Libra, Capricorn. The Vargottama sector is the first 3°20’ of the sign and gains strength, especially for a planet situated there in its own or exalted sign, as with Saturn in Capricorn. It also repeats in the various sub-charts known as varga (or harmonic) charts. The conjunction of Jupiter and Saturn is also a Graha Yuddha (Planetary War). The Vedic principle of Graha Yuddha dictates that when any of these two planets (Mercury, Mars, Venus, Jupiter and Saturn) are within 1° of each other, either in the same sign or adjacent signs, one planet is conquered by the other and the affairs over which that planet rules can be considerably diminished. Since the Vedic classics give conflicting rules on this topic, I have done extensive research to determine some effective working rules and principles, initially shared by my friend and mentor, the late Chakrapani Ullal. Based on our joint research (which I wrote up and took further) we determined that these five planets have primacy over each other based on these three factors, in this order: 1) size (Saturn gets primacy due to its large ring system); 2) brightness and 3) orbital speed. Saturn as victor of the Graha Yuddha wins in the nakshatra of Uttara Ashada, meaning “the latter undefeated” or “later victory,” also, “unstoppable victory.” Its desire is to gain “a victory that can never be lost.” The planetary owner of the nakshatra is the Sun, which is a planetary enemy of Saturn. As the karaka of leadership, of kings and presidents, often associated with nations and tribal groups, Sun is pitted here against Saturn in a battle of wills. (The Dec. 2020 conjunction recurs in the same nakshatra, repeating this theme.) And though Saturn is supposed to symbolize democracy, I give far greater weight to the business strength of Saturn, and in its own sign of Capricorn it rules over corporate conglomerates. As we know, since the 1960s they have dominated increasingly over the affairs of nations. Likewise, due to Jupiter’s loss to Saturn in Capricorn in the Graha Yuddha, and with Jupiter as ruler over journalism, education, publishing, the law and legal systems, we see how during the EARTH period commercial or political factors have won out increasingly to decide what is “knowledge” or “science” or “fact-based reporting” or “criminal behavior.” Legal and justice systems have clearly been compromised, as witnessed at the national level by how the U.S. Dept. of Justice, the NSA, FBI, opposition party and mainstream media have relentlessly conspired to destroy President Trump and his allies, starting from his candidacy in 2015 and continuing to the present time. A totally false and baseless document (“the Russian dossier”) was fabricated to conduct illegal surveillance on Trump and his team (paid for by the Clinton campaign and the Democratic National Committee). It continues on with Mueller’s out-of-control “investigation” for over 2 years. But the leftist mainstream media continues to ignore the facts and the shattering of basic constitutional rights in order to promote their agenda. Trump was elected largely because he does not represent either Establishment party, though he ran as a Republican. Voters enthusiastically supported his policies on trade, immigration, and more. As such, he has already successfully reversed many of the Globalist policies of previous presidents (Obama, Clinton, Bush 1 and 2), and the Establishment (or Deep State) is very angry about that. At meetings in Europe in Nov. 2018 French President Macron strongly berated President Trump for supporting nationalism or even using the word “Nationalist.” As quoted earlier, Macron said “Nationalism is treason.” Germany’s Chancellor Merkel soundly supported Macron. The French and German citizens do not necessarily agree, but Trump was shamed for his patriotism. Since Jupiter rules over the nation-state, we have already established that national sovereignty is greatly challenged during the EARTH period, whereas during the FIRE period (1723-1921) many important nation-states were founded and strengthened, since Jupiter does much better in FIRE than Saturn. And generally, I have observed that nations established before Feb. 18, 1961 are stronger. During the FIRE TO EARTH MUTATION period (1901-1961), the FIRE of nationhood and patriotism was still strong, promoting the founding of some major nations, including India and Israel. Approaching the 60-year mark in Dec. 2020 in the 120-year core cycle of the EARTH period, (containing no Mutation periods), we will see if the prevailing trends increase or are fought back. President Trump is working to re-establish more clear boundaries on U.S. trade and immigration. He has many supporters who want a strong nation with strong boundaries and trade laws. But his many political enemies want to restore the momentum towards Globalism and turn their backs on the sovereign nation-state. With the passage of 8 years since my original article on this subject in Oct. 2010, it has become clear that the whole Globalist agenda should be added to that of the corporate conglomerates as posing a real threat to the sovereignty of nation-states. And to a certain extent they are already intertwined. We see this battle being waged in the run-up to the next JU-SA conjunction in Capricorn in Dec. 2020. But for the larger picture we look to the chart of the 1961 JU-SA conjunction in Capricorn. This chart shows how each individual nation stands up to the onslaught that has come to all nation-states in the EARTH period due to Jupiter losing the Graha Yuddha to Saturn in Capricorn. That too is weighed alongside the national chart. China has Capricorn rising in both the national chart and in the JU-SA conjunction chart of Feb. 1961. The national chart is generally not auspicious for its people (Moon), with Saturn in the 8th house from Moon in Capricorn, and ruling the sign occupied by the Moon. (USA Moon has the same condition, with Saturn in the 8th house from natal Moon, but is modified by an aspect from Jupiter.) Nor is Ascendant lord Saturn well placed from the Capricorn Ascendant. But foreign trade is favored, as the 12th house lord Jupiter is in its own sign in its own house, strengthened by its Vargottama status, and national expenses are also minimized. The strong income through foreign trade confirms the message in the JU-SA 1961 conjunction chart. (coming next). The hidden and opaque nature of the Chinese character and way of governing is well known, and described by Ascendant lord Saturn in the 8th house. Though not an auspicious house position for the Ascendant lord, Saturn in the 8th house confers longevity. And with its lordship of the 2nd house of income, finances are favored by Saturn’s aspect to its own house (Aquarius). Jupiter and Saturn are in a fire trine to each other, and in Houses 12 and 8, respectively, showing that China has a tendency to carry on based on the idealistic dynamism of its peoples and of their sense of responsibility and ability to work very hard (Capricorn Moon and Ascendant). Mercury is exalted in Virgo in the 9th house. This should bode well for matters of the 9th house, which include religion, ideological issues, the legal system, shipping, foreign affairs and trade. However, Mercury at 20°00’ Virgo is retrograde, combust the Sun (5°23’ orb) and close to the eclipse axis (3°48’ orb). The outer planet Neptune is at 21°29’ Virgo, further complicating this Mercury. Though often combust (very close to) the Sun, Mercury suffers some unpredictability and turbulence when close to the eclipse axis (Rahu and Ketu). Mercury-Ketu combined with Sun and Neptune causes both the Chinese leader (Sun) and communications (Mercury) from China to be both unpredictable and often unreliable. Neptune brings an idealistic influence, but Mercury with Neptune can bring confusion and lies leading to exchanges that cannot always be trusted. Mercury-Ketu can also be very inventive and intuitive. In Virgo, there is practicality, and in retrograde, communications may need to go over and over the same territory. We also know that freedom of speech, freedom of the press and of religion are tightly controlled in China. With government control so strong, censorship common and Chinese corporations encouraged to spy on foreign corporations, it may take a very long time, if ever, for the U.S. to resolve the disputed area of intellectual property rights. 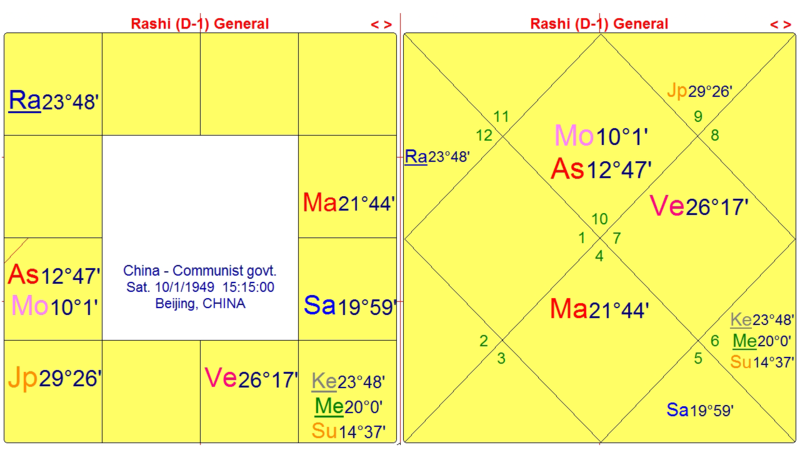 However, since China is currently completing its 19-year Saturn Dasha and is 9 months away from starting its 17-year Mercury Dasha on Sept. 25, 2019, at least we know the time is right for China to be dealing with issues of international trade (9th house). Also, it could be predicted that any negotiations with China start to become more defined the closer we get to the start of China’s Mercury Dasha in late Sept. 2019, notably inside of six months to exact (from late March 2019 onward). This is well within the framework of being able to complete major trade negotiations with the U.S. by late Jan. 2020 at the earliest. The angular houses have more power (ruled the deity Vishnu), while the trinal houses (ruled by Lakshmi, goddess of wealth) are also powerful. If the JU-SA conjunction occurs in an angular house of the Feb. 18, 1961 chart for that capital city and is supported by a strong national chart, then that nation will better handle the threat against its sovereignty by the overreach of corporate or Globalist powers. We see this happening in the U.S. chart in both birth and Navamsha charts, but for China it happens only in the birth chart and not the Navamsha chart. 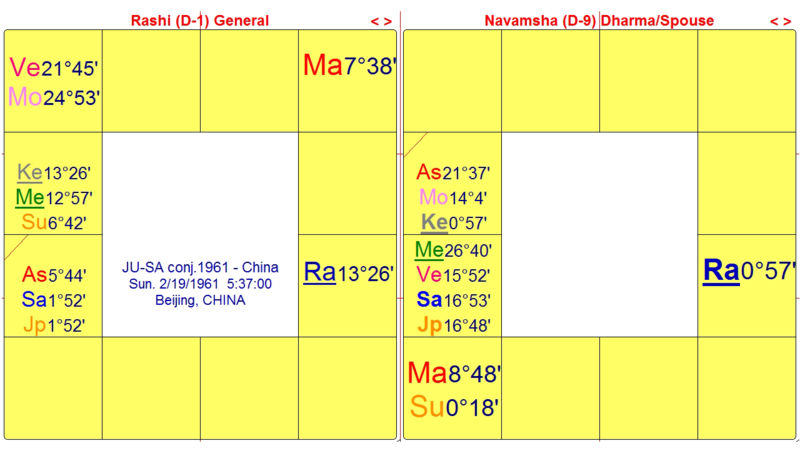 With 5°44’ Capricorn Ascendant in the 1961 chart, and Aquarius Navamsha Ascendant, China’s future from 1961 is not as fortuitous as the USA, whose capital has the conjunction in the 7th house, where the victor Saturn has directional strength (Dig Bala). For China, the conjunction is in the East where Jupiter has Dig Bala. But Jupiter is already weak, as loser in the Graha Yuddha. At least it gets some correction, under the rules of Neecha Banga Raja yoga, and as lord of 12th and 3rd houses, Jupiter has some sway, improving over time the ability of China to gain financially from income from foreign countries (12th house). Aquarius rising in the Navamsha chart puts JU-SA in the Navamsha 12th house in Capricorn. As Saturn wins the Graha Yuddha, export trade triumphs over all else, as has happened in recent decades, giving China an enviable trade surplus, compared to the sizeable U.S. trade deficit. This theme is amplified in several ways, including in the China national chart, where natal Jupiter is Vargottama in Sagittarius in the 12th house of foreign trade. China’s extraordinary export trade has come since the 1980s, helped enormously by the 16-year Jupiter dasha starting from Sept. 1984. Though economists have widely predicted that China will surpass the USA in the next 10 or 20 years, the 1961 JU-SA conjunction chart set for Beijing does not indicate China’s ultimate triumph over the West. There also has to be some semblance of democracy for a nation to thrive in this era, given the symbolism of Saturn. That may be increasingly difficult for China to convey (or pretend), as there are such tight controls over its citizens that do not seem likely to loosen. Though corporations can be ruthless in their treatment of workers, they will guard any appearance of impropriety through media control, among other means. China’s reputation for flagrant abuses of human rights classically causes problems interacting with other nations. On the positive side, the national chart has Moon is in its own nakshatra (Shravana), and Mercury is exalted in the 9th house in the Moon’s nakshatra (Hasta). Therefore education of the Chinese and general literacy should improve in the upcoming 17-year Mercury Dasha, and may help in solving some of their massive issues around air and water pollution. The upcoming JU-SA conjunctions in EARTH signs through 2080 will occur only in trinal houses of the national chart and should help in stabilizing the country and dealing with widespread poverty. The major challenges will be in keeping control over the populace, overcoming the widespread poverty, and helping to continue production and the export trade, which is the key to their economy. An Ascendant close to the Galactic Center tends to assure a nation of being at the center of world events, providing the Ascendant and the chart are not overly afflicted. The USA chart has this tremendous advantage. With 4 planets in Gemini in the 7th house of foreign countries, the U.S. extends its influence throughout the world, while tending to remain patriotic at the core (Sagittarius Ascendant). In addition, Sagittarius gives flexibility, resilience, and toughness as a national Ascendant. The most patriotic and religious of all the signs, it is also associated with the military and with sports. Thus, national pride is more entrenched than in other countries, and easily manipulated for the sake of foreign wars. It may even exist long after corporate interests have begun to usurp the real power of the state. For instance, sports events whipping up national patriotic frenzy and fervor are a global phenomenon we can easily recognize, magnified through television and social media. Ascendant lord Jupiter is strong and well placed in Gemini (sign of commerce), aspecting its own house (the Ascendant) and natal Moon in Aquarius. Jupiter also receives an aspect from Saturn in Virgo. Both Jupiter and Saturn are in angular houses, and though Jupiter holds its own, Saturn is even stronger. The JU-SA conjunction of Feb. 1961 occurred in the USA 2nd house of finance. From that time, corporate wealth has increased in general. The very wealthy classes (top 1% of American households) have been steadily enriched, while the wealth of the majority of citizens and the middle class has been steadily depleted, though this is starting to improve under the Trump administration, including with record low unemployment numbers and many more manufacturing jobs being brought back to the U.S.
As with China, the USA Mercury is on the eclipse axis, though conjoined in this case with Rahu, not Ketu. Rahu is a magnifier, pushing the energy outward, whereas Ketu tends to push the energy inward. This Mercury in the 8th house in Cancer reflects the mighty Public Relations and Advertising industries which began to develop in the U.S. government and in business just prior to the start of the EARTH period (Sept. 1921). In terms of duplicity, Mercury in the 8th house in a water sign has some traits in common with China’s Mercury retrograde conjunct Ketu, Sun and Neptune. Communications spread far and wide with Rahu’s influence, but it’s not always clear what lies behind the message, just as with China’s Mercury configuration. One term for this would be “hidden agendas.” And since China and the U.S. have this in common, the way the two countries come to resolve the Trade War between them may never be fully known by the larger public. Some issues may be resolved in untraditional or surprising ways. When the announcements are made and papers signed, it may remain enigmatic as to what exactly has transpired and how the agreement was negotiated. 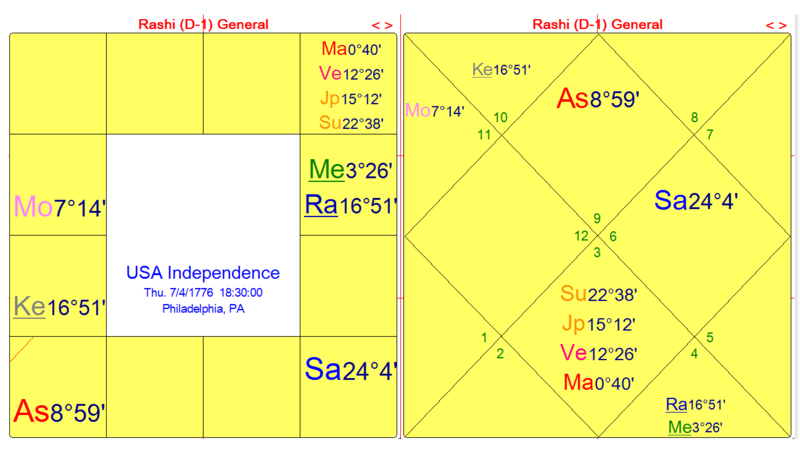 The USA is currently in the 18-year Rahu Dasha (since late Sept. 2015). Since Rahu is conjoined with Mercury in Cancer and in Ashlesha nakshatra ruled by Mercury, this Rahu is working overtime to spread the American version of the news. With the 8th house influence in a water sign plus Rahu and Ketu involved, this news can easily descend at times to levels of propaganda, scandal, and misinformation. Whatever it is, it tends to be dramatic, eye-catching, emotionally gripping and capable of holding the world’s attention. The whole world tends to get involved in U.S. politics and cultural or sporting events. This may be why China (or any other country) aims to steal American patents, products and ideas. Despite widespread predictions that the East (China and Asia in general) will triumph over the West in economic and political terms, this chart indicates that the USA can continue to remain strong in the EARTH period, especially from Feb. 1961, as long as the nation remains in a delicate state of balance with the dominance of corporate interests in government, and a semblance of democracy. Saturn triumphs when setting in the West (Dig Bala, best possible angle), while Jupiter triumphs when rising in the East. Since the conjunction falls in an angular house in both the birth chart and Navamsha, Jupiter is not as utterly crushed, though it is still diminished by Saturn. With Jupiter-Saturn in the West, giving the victor Saturn even more power over Jupiter, this assures that business interests will have greater and greater sway over the citizenry, through enacting laws, etc. From the early 1960s lobbyists became far more numerous in the U.S., ensuring that corporate interests would prevail over legislative ones. The trend favors American-owned conglomerate businesses, especially from 1961 to 2080. They can still dominate, as is confirmed by both the Navamsha chart and the USA national chart. 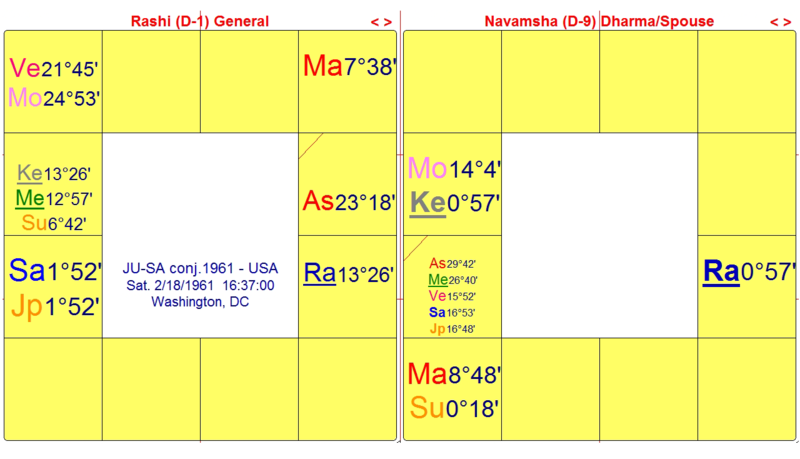 Both Mercury and Jupiter are Digbala (best angular house) in the Navamsha chart. Their placement in the Navamsha Ascendant gives them strength, and assures that with Mercury-Jupiter together the U.S. always has a lot to communicate to the world, through its culture, politics, new technology or general news. The Moon (populace, women) is auspicious near the 9th house cusp, along with 11th lord Venus (women, the arts) exalted in Pisces, forming Raja and Dhana, yogas for power and wealth, both planets in Revati (“wealthy”) nakshatra. But any gains made by the people, by women and by the arts are subject to sign lord Jupiter’s inherent weakness in its sign of debilitation and as loser in the Graha Yuddha, and by nakshatra lord Mercury’s inherent weakness in the 8th house (debts) conjunct Ketu. The arts have continued to lose federal funding, as an example. According to Charles Ortel, the U.S. currently has a Gross economic output of $20 trillion per year. This is at least 3 times the Gross economic output of China, using fair accounting. The U.S. has a fraction of China’s population, yet higher growth rate and vastly greater household consumption rate: $40,000 per person per yr. in 2016 compared to China’s $3,000 per person per year in 2016. The astrology too supports the continued status of the United States as a top economic power, as long as democracy, nationhood and its usually sovereign boundaries are maintained. The issue of Globalism vs. Nationalism seems to be coming to a major turning point between 2018 to 2020, just as we approach the 60-year mark from the Feb. 1961 JU-SA conjunction. With Sagittarius Ascendant in the USA national chart, the U.S. has a good chance of retaining national interests and staying out of the pitfalls of unregulated Globalism and unlimited mass migration. For its part, since China is largely an export economy, it prefers a more Globalist approach. Ironically, the Chinese government maintains a tight control over its citizens, so it is unlikely to bend to Globalist demands to give up its sovereignty. Copyright © 2018 by Edith Hathaway. All rights reserved.